Wednesday: Gradual clearing, less humid. Highs in the 70s and 80s. Wednesday Night: Mostly clear. Lows in the 50s and 60s. Thursday: Partly cloudy. Highs in the 70s and 80s. After strong thunderstorms Tuesday evening, storms weakened overnight but a few showers are holding together through daybreak in southern New England and along the south coast. A few locations in New England topped 95 degrees yesterday, and then we had several damaging (hail and wind) thunderstorms track from northwest to southeast bringing an end to our little hot spell. It takes three consecutive days of 90 degrees plus to make a heat wave, and we only made two days this week, Monday and Tuesday. Temperatures Wednesday start out in the 50s north, in the 60s to near 70 degrees south. High pressure moves from Ontario and Quebec today, supplying a mostly blue sky. 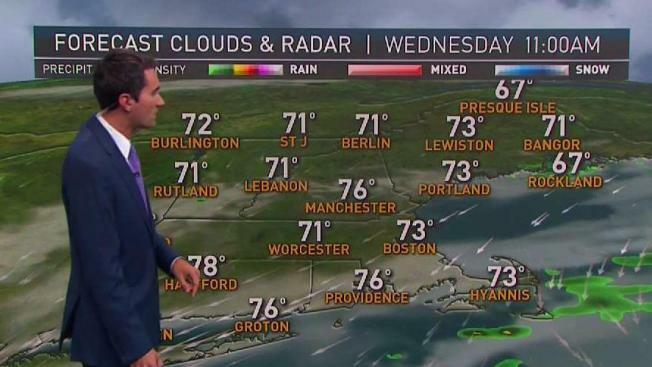 The exception is in Massachusetts, Rhode Island, and much of Connecticut, where clouds may linger with a chance of a shower, too. There will be high temperatures under total sunshine in northern New England in the 70s, to low 80s away from the shore in southern New England. Wind will tend to come from the northwest inland, and from the northeast near the coast, keeping the beach a little cooler, but it does look like a pretty nice beach day for most of New England. A nice night for sleeping is coming up with temperatures falling into the 40s and 50s to start Thursday. With low humidity, it looks like a beautiful day with high temperature near 80 degrees, cooler near the coast once again with a light seabreeze. Tropical cyclone Chris is expected to pass more than 400 miles east of New England early Thursday morning, meaning little to no impact, even at the beaches, maybe just a little bit of a groundswell for the surf riders. Friday and into the weekend features a weak front from the south and a weak front from the north trying to put the squeeze play on here, with mostly dry weather, we'll have sunshine with afternoon clouds and a chance for a shower or thunderstorm each day, but most of us stay dry with a high temperature in the 80s. It will be a little cooler at the beach. There's potential for a heat wave next week with a high temperature near 90 degrees on Monday, that may last until Tuesday or Wednesday, with a chance of showers and thunderstorms but once again only a minor chance, and most of us are not going to see much rain in the foreseeable future.